The ancient Greeks used the power as a rallying figure to heroic quest and in heraldry it is sometimes depicted as breathing fire through its nostrils and mouth and rearing up on its hind legs as if in battle. To the Arawak Indians, who were great believers in the afterlife, the panther was associated with death and rebirth and linked to all living things, making it a symbol of awakening. 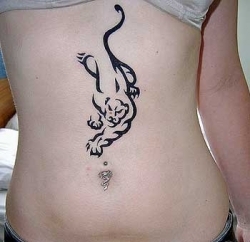 With such a rich symbolism surrounding panthers, all panther tattoos need to be chosen with great care as the stance is particularly important in conveying the meaning you are aiming for. If it is for its feminine associations, you could have your panther baring teeth and claws to suggest her fierce protection of her cubs. This panther is not a lady to tangle with! Alternatively your panther could sit on a boulder or rock in regal solitude, guarding and ever-watchful, for panthers are solitary animals and great guardian figures; or perhaps basking in feline contentment along the branch of a tree. 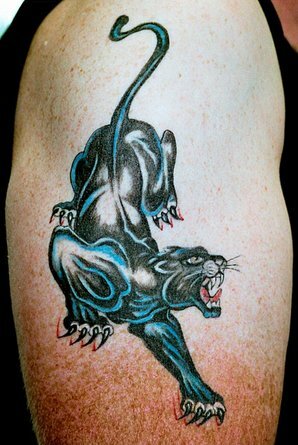 Like all cats, panthers love to stalk, so your tattoo could show your panther stealthily hunting its prey, rippling with silent energy, just before the pounce. 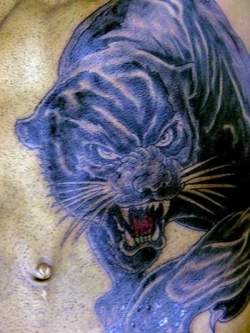 If tattooing a very large area, your panther could be part of a larger scene, incorporating other animals in a jungle or rainforest setting. On the other hand, if you want a smaller design, you might opt for just the head, alone or perhaps surrounded by foliage. 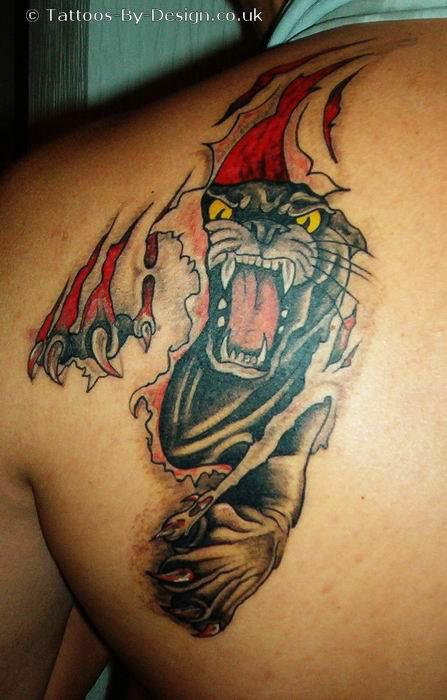 Some of the popular body areas for larger panther tattoos are across the shoulders or upper arms. The upper back area is perfect for the full-stretched body of the animal. The back is also a good place if you are considering a larger mural. Panthers are often placed winding around the limbs to capture the fluid lines and undulating strength of this graceful creature. 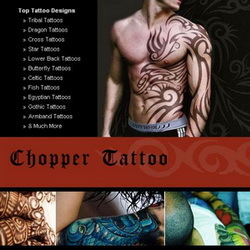 Whatever part of your body you choose and in whatever pose, all panther tattoos make very powerful and personal statements about the wearer.